The Hungry Photographer: All Hail The Internets! In order to keep what I was working on all top secret like, I created an instagram alias for the purposes of our shoot. Thus, cakegirl89 was born. The day Maclean's hit newsstands "cakegirl89" started receiving likes and comments. Which of course, is the part that I find to be quite hy-sterical. 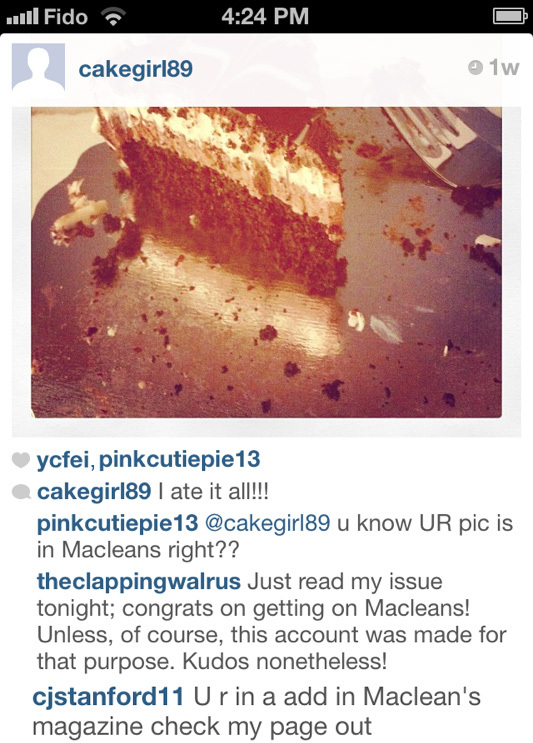 I thought I'd take this opportunity to thank "pinkcutiepie13" for having my back and letting me know that my instagram shot was being used in Maclean's, and of course to "theclappingwalrus" who hit the nail on the head. Keep it coming social media! You never cease to amuse me.